Insulating concrete forms (ICFs) are a method of construction using components manufactured from expanded polystyrene (EPS). The forms are stacked, steel-reinforced, and then filled with concrete. When completed, ICF walls provide a solid monolithic structure. The material offers a variety of benefits for residential, commercial, medical, educational, and multistorey construction. The continuous insulation, thermal mass of the concrete, and airtight envelope all combine to offer energy efficiency in warm and cold climates. 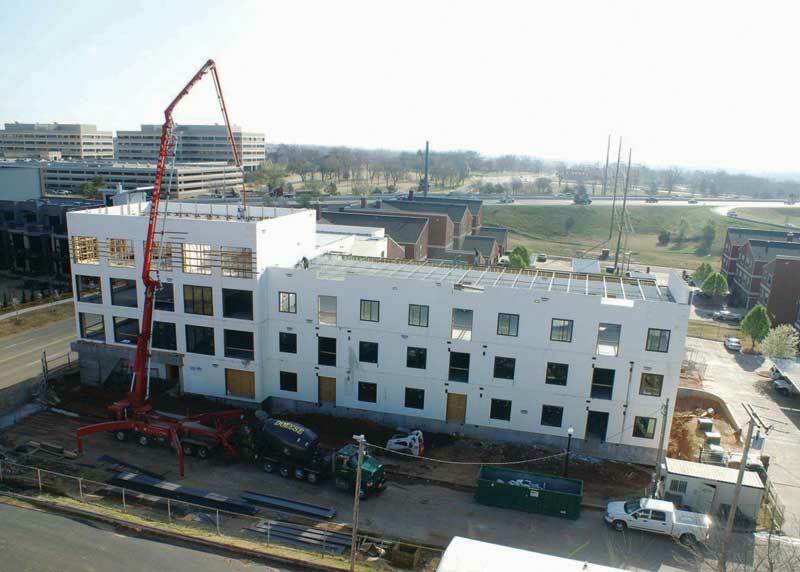 Further, the steel-reinforced concrete cores in ICF buildings are resistant to fire, hurricanes, and tornadoes; they can be engineered for all seismic conditions. The foam and concrete structure of ICFs also means the homes and buildings are quiet, draft-free, and do not enable mould. Commercial builders will find fewer trades are required, resulting in greater jobsite efficiency. Additionally, since only simple handset tools are needed, the cost of heavy, expensive equipment is eliminated. 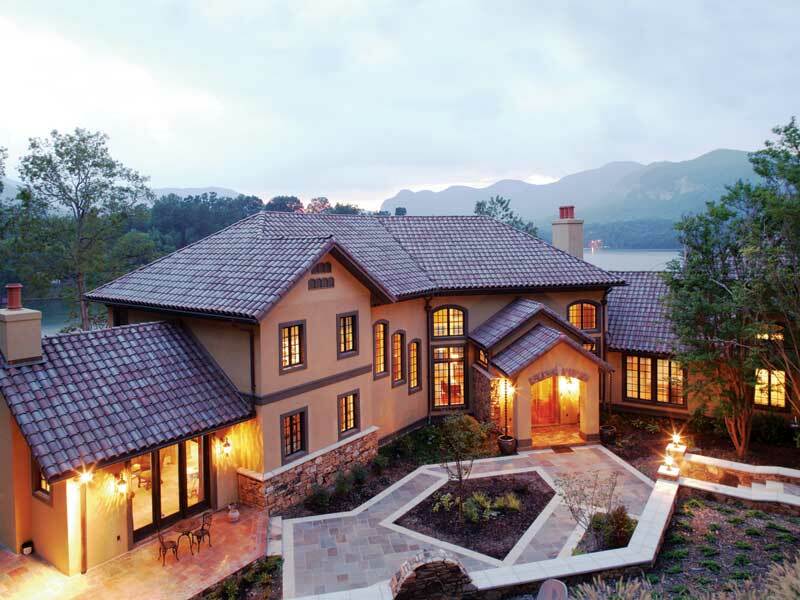 ICFs are also “winter-friendly”—builders can employ them year-round and spend less on winter heat and hoarding costs. Many of these benefits and advantages are intuitive, but have yet to be quantified. In 2016, the Insulating Concrete Forms Manufacturers Association (ICFMA) commissioned a series of comprehensive studies comparing traditional wood 50 x 150-mm (2 x 6-in.) exterior wall construction to an ICF wall constructed with a standard 150-mm (6-in.) core. An illustration of an insulating concrete form (ICF) wall. The research project came about because, for decades, the ICF industry had been asked to provide definitive proof the thermal mass, airtightness, and continuous insulation (ci) features of its building products could deliver real, quantifiable benefits. This article examines the results. This particular ICFMA initiative marks the first time a fully Standards Council of Canada (SCC) and International Accreditation Service (IAS) testing facility has been commissioned to evaluate a realistic side-by-side comparison of the two types of wall assemblies within a single study. It quantifies the benefits of both thermal mass and the continuous insulation properties of ICF technology in comparison with traditional code-compliant wood-framed cavity insulated systems. The studies undertaken at CLEB Laboratories (formerly Air-Ins Industries Inc.) in Varennes, Qué.—just east of Montréal—subjected two specimen walls to tests that were extended over a month-long period of study. One wall was constructed as a code-compliant R-20 wood frame wall with typical gypsum wallboard and exterior vinyl siding finishes applied; the other was a standard 150-mm (6-in.) core ICF wall with two layers of Type II expanded polystyrene (EPS) foam. Each was approximately 64 mm (2 ½ in.) in nominal thickness and, again, had the exact same code-compliant finishes. The tests were conducted in strict accordance with ASTM C1363-11, Standard Test Method for Thermal Performance of Building Materials and Envelope Assemblies by Means of a Hot Box Apparatus. Quantitative results from the test led to the following conclusions. The tested ICF wall assembly provided 58 per cent better effective R-value/RSI than the tested 2 x 6 wall assembly. The tested wall assembly generated up to 60 per cent energy savings compared to the tested 2 x 6 wall assembly. The CLEB studies illustrated when comparing the amount of energy required to maintain both walls at steady state over this same 324-hour period, the wood-frame wall consumes 149 per cent more energy than its ICF counterpart. Even after both walls attained steady state under the test conditions, the ICF wall consumed 60 per cent less energy than the wood-framed wall specimen to maintain temperature. Greater jobsite efficiency can be achieved by employing ICFs as fewer trades are required for a project. The ICF wall assembly makes measurable contributions to thermal mass and the interior and exterior layers of continuous insulation. The test results prove the ICF assembly took nearly 324 hours to reach steady state performance when exposed to an exterior air temperature of −35 C (−31 F) whereas the wood-frame wall reached steady state within just 60 hours of the start of the test. This indicates for most real-world applications, an ICF wall likely never reaches steady state. This finding quantifies the thermal mass effect of the high-mass ICF wall and also illustrates its enormous benefits—in that 264-hour interval in this test, during which the wood-frame wall was in steady state and the ICF wall was not, the ICF wall had 60 per cent less energy loss than the wood-framed wall. The implications of this are significant. For example, if one “typical” home, with 186 m2 (2000 sf) of wall area, is constructed in wood frame to permitted code, while the other uses ICF technology, the study indicates in many climate zones, during the most extreme cold conditions, the latter can save up to 60 per cent of electrical consumption, when incorporating the average kWH value for all of North America.